Bohemian Talmudist; died at Prague in 1829. He wrote: "Dibre Meir," novellæ, on the Talmudic treatises Giṭṭin, Shabbat, Rosh ha-Shanah, and Baba Meẓi'a (Prague, 1810); "Sbemen ha-Ma'or," commentary on the Shulḥan 'Aruk, Oraḥ Ḥayyim, and more especially on its two commentaries, Magen Abraham and Ṭure Zahab (ib. 1816). He also published his father's "Mar'eh Yeḥezḳel" (ib. 1822). 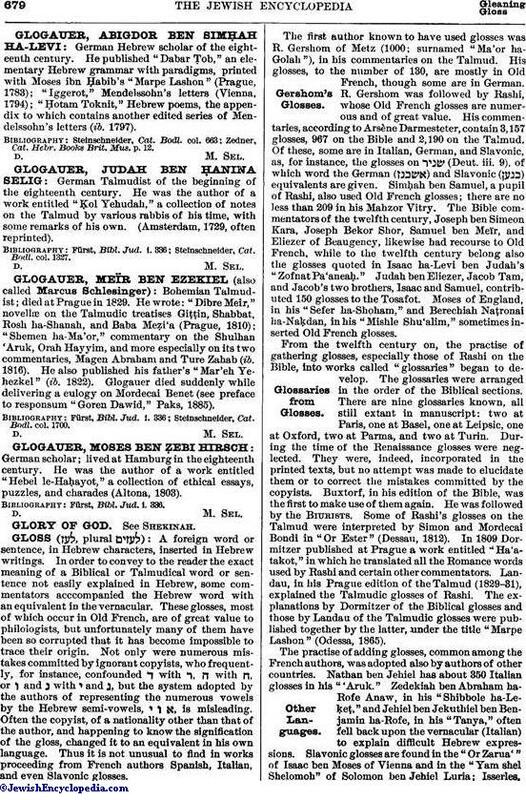 Glogauer died suddenly while delivering a eulogy on Mordecai Benet (see preface to responsum "Goren Dawid," Paks, 1885). Steinschneider, Cat. Bodl. col. 1700.